Altho Jiyeon Yoo of LA Times blog disses Chicken Day's sauce as being too odd, it remains my fave... just a wee bit medicine to keep my tastebuds dancing. Dang. Now I'll have to try it. I'll tell myself it's healthy. Speaking of LA Weekly's Best Of issue- how lame was it? I don't know about you but I would like the categories to be more direct. How about ones like "Best Asian Fried Chicken" instead of the cutesy wanna-be-hipster categories they had? Oy I was seriously disappointed in J Gold....it soo doesn't seem like him....? 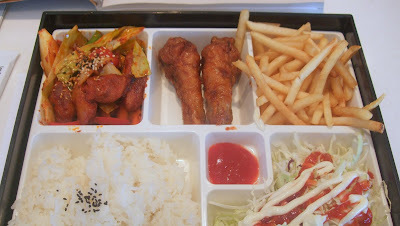 There also is a Kyochon chicken place inside the Freshia market in Torrance. Just in case you have readers in that area. It's on the corner of Torrance and Crenshaw boulevards. And the market itself is a fun place to check out!